Apparently, the hot new neutral is navy. It's warm, it's classic, and it tones down that impulse purchase in chartreuse piece you just had to have because you loved-it-so-much-you-couldn't-live-without-it color. In fact, it goes with everything! That is why we selected Ralph Lauren's "Club Navy" to be the standard for our navy lacquer in our palette of 16 colors. Ralph knows all about navy. His "Club Navy" is not too purple, not too black. It is rich without being royal and we think it is a color that everyone should have a little of around the house and in their wardrobe. Men love it, women love it - it's a crowd pleaser. oomph thinks it is fantastic and encourage it paired with Knockout Orange, Parakeet or Eros Pink. Preppy but chic - a classic combination. 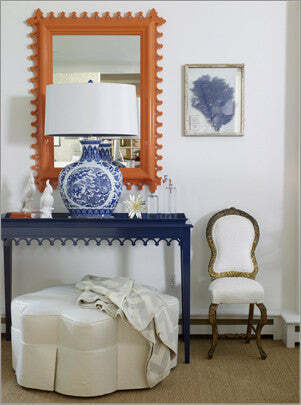 The Wahington Post quite agrees and selected the oomph Palm Beach Demi Lune as the perfect Navy Piece to add to a room. “Navy is classic, and it goes with everything,” D.C. designer Zoe Feldman says. “It adds warmth in a room and gives depth to walls. And you can have fun with it, too.” Pair dark blue with white or red for a crisp, traditional look, or marry it with magenta or chartreuse for something unexpected. Navy can be considered a masculine color, but mixing it with certain shades, such as pink, purple or teal, can bring out its feminine side, Feldman says. Well heck, we knew that.